Floorbin elevators are used to store, elevate and bulk feed a wide variety of parts, over-the-top, to various overhead chutes and manipulators. 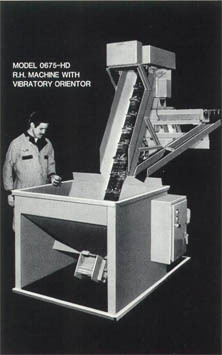 This brochure is dedicated to combinatons of a floorbin elevator and straightline vibratory orienting devices. Other applications are covered in seperate literature. Choices of cleated belt, cleated chain or non-cleated magnetic elevators are available to suit part condition, size, shape and weight. All Spectrum feeders are furnished with top mounted elevator drives, having standard commercially available components. Choices are available to suit power, production and flexibility needs. Spectrum feeders include many time proven features for reliable, jam free performance. They were developed during extensive field experience by people with a prideful dedication to quality performance. Study our list of popular options and accessories that may improve the utility and payback of your feeder choice.